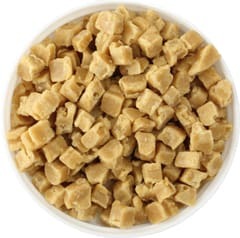 Made using the finest ingredients, this Diced Caramel Topping is a divinely tasteful addition to your cake, cookie or beverage. Store in ambient, dry conditions (15-20°C, <60% humidity), away from strong odours. After opening, store in ambient, dry conditions away from strong odours, sealed in original packaging. Keep closed when not in use.